Cat watery eyes can be caused by many different problems, including allergies, a number of viral infections, defects or an absence of the tear ducts, and even the type of breed can determine the cause of this problem. Some breeds are more likely to have physical defects in the tear ducts or other eye features, while other breeds may be more prone to viral infections or nutritional deficiencies that affect the immune system. Treatment may include antibiotics, cat allergy treatment sessions, or even artificial tears or medicated eye drops prescribed by your vet. The biggest cause of cat watery eyes is an infection from the feline herpes virus, which also causes other signs of conjunctivitis and irritation. Any cat eye discharge should be evaluated by a vet, to ensure that there is no bacterial cause or a foreign object that has become stuck in your pet’s eye. Cats that go outside are at risk for being scratched or injured during a fight, so you should always keep your pet safe inside and prevent them from wandering outdoors. Cat watery eyes can also be caused by scarring from previous injuries, and in severe cases surgery may need to be performed to remove any excessive scar tissue. A saline solution can be prepared using one cup of water at room temperature with one fourth of a tablespoon of salt mixed in. This is a cat eye infection home remedy that can work against almost all causes of irritation and watering, and this solution should be squeezed over your cat’s affected eye three to four times a day. 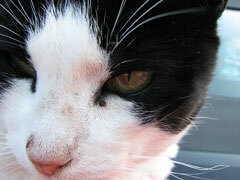 The salt will eliminate any infection causing bacteria, and will help treat cat watery eyes for a low cost. If home remedies do not improve the condition within a few days, or the discharge or other symptoms become more severe, then a trip to the vet may be needed.